I sure wasn't expecting Baker there seeing that he dropped his role in Naruto, which is a union dub, and that's the last time he was in any anime dub. And JSYK, Mick Wingert is not related to Wally Wingert. Anyway, I'm hoping to see more union dubs in the future as they have pretty much gone by the wayside and they mostly happen when union VA's are needed to reprise roles. Well, I'm hoping there will be more union dubs in anime, because that's the only way Troy Baker can get new roles in anime (since he's obviously a union-only voice actor). But even so, it's pretty surprising that Troy Baker got an anime role for the first time in 6 years since his role in Persona 4 anime as Kanji in 2012. Usually, I expect most voice actors who break big into AAA video game titles like The Last of Us, Infamous: Second Son, and Bioshock Infinite to mostly leave voice acting in anime dubs mainly because many voice actors that become famous and mainstream through AAA video game titles will end up working more in those video game titles over JRPGs or anime work (mind you that while Troy Baker became more mainstream with AAA video game mocap and voice work, it's mostly his JRPG roles and his minor anime roles that help got him recognition). Although I will say there are noticeable exceptions. Even funnier when Matthew Mercer was mostly taking over most of Troy Baker's previous anime and JRPG roles when Troy was primarily working on AAA video game titles. 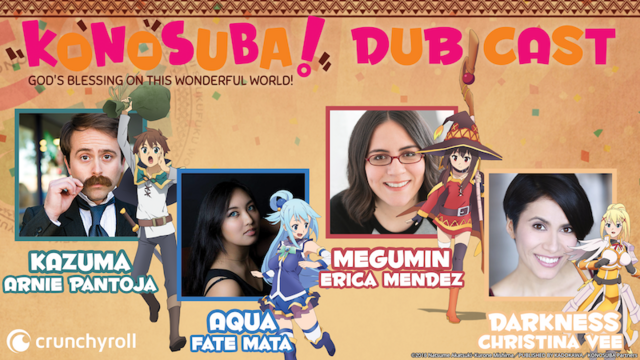 Crunchyroll just announced the dub cast for this show that premiered at Crunchryoll Expo. This show's dub will launch the same day as in Japan on Crunchyroll. This show is now up on Netflix, and the credits for the English dub are as well. This show is now up on Netflix, and here is the dub cast list. There is a lot of multicasting as there are quite a a number of bit parts in this show. Last edited by Buckeye; 12-24-2018, 02:40 AM. The Seven Deadly Sins: Prisoners of the Sky movie is now available for streaming on Netflix. And with it is an English dub, credits included. Going by staff credits, the dub was produced at SDI Media/Spliced Bread Productions rather than Bang Zoom like the main series was. Viz's recently solicited Mazinger Z Infinity Blu-ray credits NYAV Post for the English dub production on the back cover. With that, half of my job for tonight is done. Last edited by TnAdct1; 01-06-2019, 01:03 AM. Crunchyroll has announced a dub for this show. Last edited by Buckeye; 01-07-2019, 02:24 PM. It sure has been a while since Alex von David voice directed an anime title that isn't licensed by Aniplex of America. I recall it was Toradora. Another new arc, another new Stand user (this time one I really can't talk about due to plot reasons). Alex von David's tweet also lists off (with no specific roles attached) Ryan Bartley. Last edited by JRPictures; 01-17-2019, 04:20 AM.